Victory malt is Briess’ answer to Biscuit Malt and as one would suspect it will contribute a myriad of bready and biscuity notes to your brew. Briess uses a 6-row base grain in the production of their Victory malt and then they lightly roast it to give the characteristic toasty quality and golden amber hue. 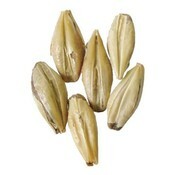 This malt has a wide array of applications despite its seemingly specific flavor profile. The nutty, toasty, bready, and biscuity notes you’ll find in Victory malt make it very appropriate for various Lager styles as well as darker beers and Nut Brown Ales. Also, Victory malt will add a nuanced complexity to a myriad of styles if used very conservatively. Give your next IPA or Pale Ale a malt balance at 1-5% of your grain bill or really make that Doppelbock smell like a loaf of bread at 5-15%.